These are some of my favorite Scenic Photo Location Guides. 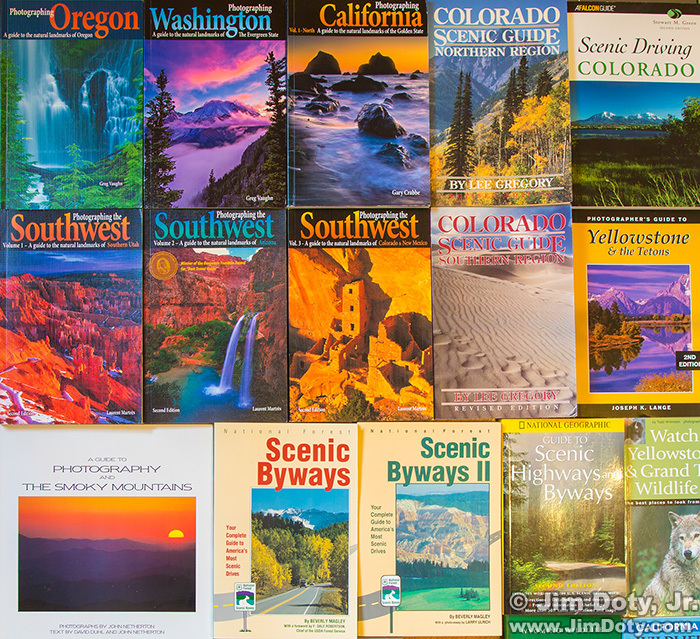 For more information on these books, read The Best Scenic Photo Location Guides. How to Photograph America’s National Park, Digital Edition by Tim Fitzharris. This is the newer National Audobon Society edition. National Park Photography by Tim Fitzharris. This is the older AAA edition. National Forest Scenic Byways by Beverly Magley. This is the original book that covered the best drives all across the U.S. If you decide to get the three books that follow (“Far West”, “Rocky Mountains”, “East and South”), you will not need this book. National Forest Scenic Byways Far West by Beverly Magley. Page created December 8, 2017. Updated May 4, 2018.